Welcome to Calvert Farm | a small family farm in Cecil County, MD offering CSA produce subscriptions. Calvert Farm is a small family farm. We are located near the borders of Delaware and Pennsylvania. We have been farming sustainably & chemical free since 1994. Calvert Farm in the Washington Post! On February 4, 2009 there was an article about CSAs in the Washington Post "Where to Sign Up for a CSA " and Calvert Farm was listed. See Pam Stegall Roberts on CBS Baltimore! We welcome your questions and encourage you to visit our farm. Calvert Farm continues a tradition of working with other small farms to bring the best variety and freshness to your table. These small farms grow using sustainable / natural methods/chemical free methods. Calvert Farm offers a Summer CSA, Fall CSA, and Winter CSA produce subscription. Go to our CSA information page for all of the details. You will find links to our applications (also available on the left of each page) as well as details about what produce may be included in your weekly boxes. And take a moment to view the slideshow at the bottom of the info page to see what one of our subscribers got in her weekly share. 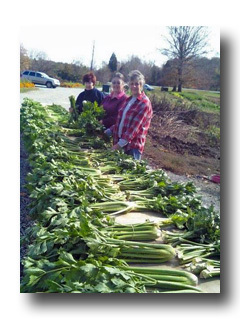 Calvert Farms supports and accepts Maryland Market Money and you can too! Your donation will help food-insecure Marylanders stretch their limited food budgets and gain better access to fresh, healthy, local foods. Donated funds are sent directly to the Maryland Farmers Market Association who then matches the donations dollar for dollar! We have several pick up locations and each has their own day and time. Look over the list to find the nearest and most convenient location for you. You can also download a copy of the list. Have a suggestion about another location for pick up? Please contact us by phone at 410-658-3914 or by email at farmer@calvertfarm.com to inquire about making arrangements. Sign up Now for the Summer CSA! Please contact us for further information about our CSA (Community Supported Agriculture) by phone at 410-658-3914 or by email at farmer@calvertfarm.com. We thank you for your interest in Calvert Farm. Your support helps keep the family farm alive and well.